This purchase includes a PowerPoint Presentation on "Analogies". 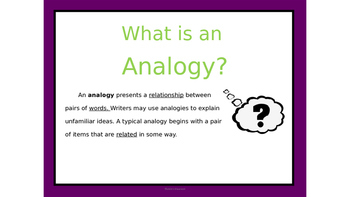 It may be used as an introductory lesson for vocabulary strategies or to review analogies with students. 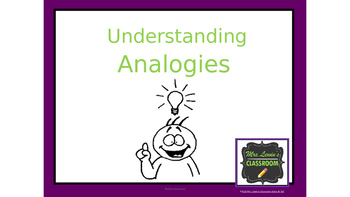 I enjoy using this lesson as a whole-group mini lesson. This purchase also contains slides to allow students to work together and think critically in a cooperative, group setting. *See the student handout in correlation to the presentation.